What she does: From 2000-2010, she was the program leader of IFC Against AIDS, a program that she initiated shortly after joining the International Finance Corporation (IFC), the private-sector lending arm of the World Bank Group. Durier and her team worked with multiple IFC investment clients, particularly across Sub-Saharan Africa and India, to set-up workplace and community programs dedicated to the prevention and treatment of HIV / AIDS and other health issues. 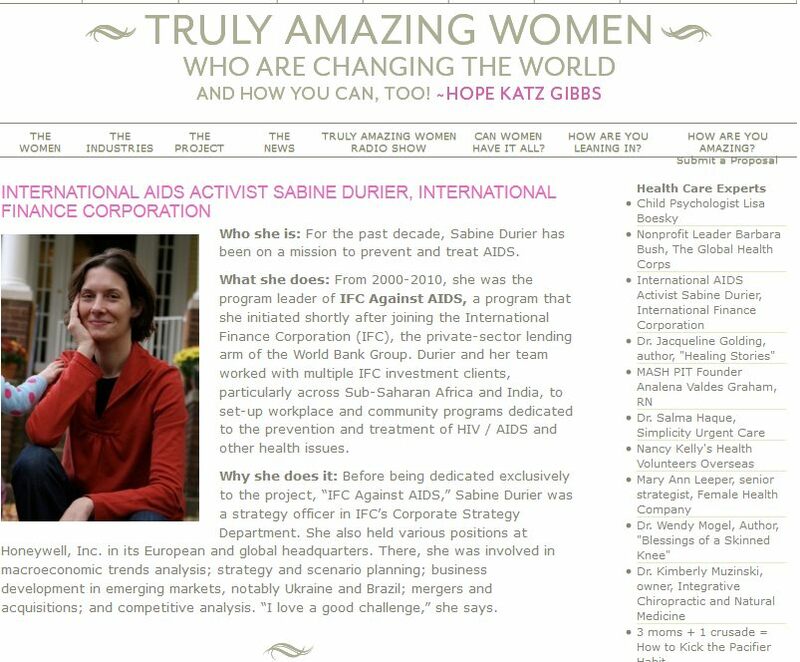 Why she does it: Before being dedicated exclusively to the project, “IFC Against AIDS,” Sabine Durier was a strategy officer in IFC’s Corporate Strategy Department. She also held various positions at Honeywell, Inc. in its European and global headquarters. There, she was involved in macroeconomic trends analysis; strategy and scenario planning; business development in emerging markets, notably Ukraine and Brazil; mergers and acquisitions; and competitive analysis. “I love a good challenge,” she says. Hope Katz Gibbs: We understand that every project the IFC launches has a triple bottom line in that it should lead to positive social, economic, and environmental impact. Can you tell us how the IFC Against AIDS program accomplished those admirable goals? Sabine Durier: The IFC is dedicated to making investments that have a positive impact on the world. This helps the leaders of the organization identify the issues that are most compelling, so they can utilize their resources in the most effective way possible. Hope Katz Gibbs: Eradicating AIDS is obviously an ambition that is complicated to achieve. How did you first become interested in tackling this worldwide problem? Sabine Durier: I came to the U.S. from France in 1996 to study at Georgetown University. I then took a job at Honeywell in Minneapolis, where I worked on foresight, strategy, and innovation. I developed scenario plans, researched mega-trends, and did business-plan development. It was incredibly interesting work, because I was working on tracking the global issues that were facing corporations around the world. But I really wanted to move back to DC. Fortunately, my brother, Dr. Nicolas Durier, had moved to DC to do his doctoral research on pediatric HIV and AIDS at the National Institutes of Health. So we rented a flat together, and, as you can imagine, AIDS became a subject of conversation at the dinner table. It was early 2000, and AIDS was severely affecting Sub-Saharan Africa. In Botswana, it had infected more than 38 percent of the adult population. Hope Katz Gibbs: AIDS was primarily ravaging young and middle-aged adults at the prime of their working years, so it was really taking a social and economic toll. Sabine Durier: That’s right. The pandemic affected GDP growth, per capita consumption, and employment — not to mention relationships, families, and children. So my brother and I spent hours discussing possible solutions, trying to figure out what could be done on a social level to make a change. Hope Katz Gibbs: Is that when you got involved with the IFC? Hope Katz Gibbs: It must have taken a lot of research to get a handle on the pandemic and its impact on the private sector. Hope Katz Gibbs: In a February 2008 white paper, you outline lessons you learned from the innovation you did through the IFC Against AIDS program, and how you established a business case for the work you wanted to do. Can you give us some of the highlights of those findings? Sabine Durier: A critical element in developing a new product or service is the ability to build a strong business case. This includes careful analysis of the environment, issues, and opportunities, and the ability to articulate what the organization can contribute. Back in 2000, a few large international companies had started to engage the AIDS problem to protect their own profits, consumer markets, and reputation. Some also were driven by an agenda of corporate social responsibility. Fortunately, there was compelling data on the impact of AIDS on costs, reputation, and viability of enterprises working in the countries that were most affected by the disease. Private-sector engagement, however, was sporadic.